Space Scoop brings you the latest astronomy news from across the Universe each week. The articles cover all the most exciting cosmic events in a language that's easy to understand. With Space Scoop you can learn about the latest missions aboard the International Space Station, watch as new planets are born and travel with us to the early Universe. All our news and pictures come directly from 13 of the best space agencies in the world, and we bring them to you without delay. So join us each week and make sure you never miss the latest scoop! Explore the Universe and learn about exciting new discoveries. Understand that we still have a lot to learn about the Universe – maybe you’ll be making new discoveries one day! Share cool facts with your friends. Learn about our planet and the people we share it with. How is Space Scoop created? Each Space Scoop begins with a new discovery or image from space. Our partners write an article about the new science and send it to us. The next step is to take out all the technical mumbo-jumbo and make it easy to read and understand. The final story is then sent to our group of fantastic volunteer translators from all over the globe, where it is translated into 33 different languages! Finally, the Space Scoop articles are published online at the same time as the original press release so you can keep up-to-date with the latest discoveries as they happen. Space Scoop stories are provided by partner institutes. 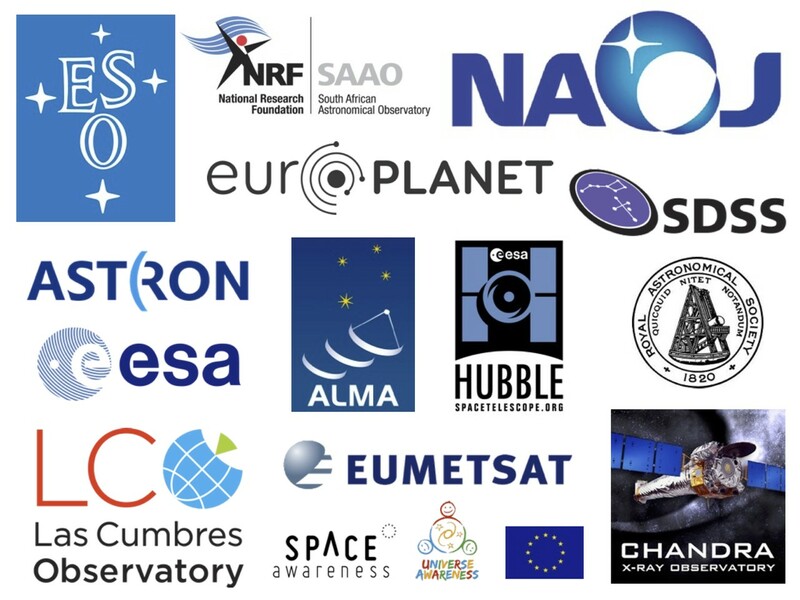 The European Southern Observatory (ESO) was among the first to join and since then the family has grown to include: NASA Chandra X-Ray Observatory, European Space Agency (ESA), National Astronomical Observatory of Japan (NAOJ), Netherlands Institute for Radio Astronomy (ASTRON), Europlanet, South African Astronomical Observatory (SAAO), Royal Astronomical Society (RAS), Las Cumbres Observatory Global Telescope (LCOGT) network, NASA/ESA Hubble and the Sloan Digital Sky Survey (SDSS). To make sure as many people as possible can enjoy news from the Universe (including very young children, people that can’t read or don’t have internet access and even the visually-impaired) we’ve made Space Scoop available in different forms. As well as written stories, Space Scoop is available as podcasts and videos, plus we have a Space Scoop app for your phone and a game! Find out more about where you can find Space Scoop below. Space Scoops are available as written stories, which can be read on the Space Scoop website or downloaded and printed. Space Scoop stories could make a great addition to your classroom pinboards! The stories and pictures can also be used as a fun and interesting feature on websites, magazines, newspapers and newsletters. You can find already Space Scoop available in a number of magazines, newspapers and websites such as: Anorak, Timbuktu, Nahvind Times, Universum, Astronomie.nl, Wired.com, Langitselatan, National Geographic Indonesia and Portal v Vesolje. Space Scoop is even used in school textbooks, like the story “The Universe is Big, Beautiful...and Mostly Invisible” which was featured in an official South African textbook (Spring 2013) which is used in primary schools all over the country! Lots of Space Scoop podcasts have been created as part of a project called 365 Days of Astronomy. These can be downloaded from the site or iTunes. Space Scoop partner NASA’s Chandra X-ray Observatory have also created several Space Scoop video podcasts! These can be watched or downloaded on their website, and they're shown daily at the Kennedy Space Centre! A Space Scoop app has been created for Android devices, that allows you to enjoy cosmic news on the go! Almost 200 articles are already available in the app, in 22 languages! There's also a Space Scoop game based on the addictive game "2048". The game allows you to enjoy beautiful new pictures of space while you play. Want to learn more about a specific cosmic object? Go to our Topics page. Don’t understand a space word? Find out what it means in our Wordbook. Haven’t had your fill of cosmic picture? You can find hundreds more in our Picture gallery.